I've always believed in the importance of breakfast. Even if it has been recently challenged on whether breakfast is the most important meal of the day, I still think that as much as we can, we should never skip this first meal of the day. If that is the case for adults, it is even more so for young children. A good, healthy breakfast helps them to fuel up, recharges the brain, provides strength for physical activities, improves concentration in class and reduces fatigue. That said, while it is easy to tell my kids about the importance of having breakfast, making them eat is another thing altogether. The first thing Angel does when she wakes up is to drink her milk. On some days, or rather most days, she tries to catch a little more sleep and will lay on the sofa or bed until I carry her to wash up. Yes, while I can still carry her, I like to do it sometimes especially when the easily-jealous-and-overly-possessive little sister is asleep. It's usually hard for me to find a way to make her open her eyes wide or look forward to anything when she wakes. If I do wake up early and make breakfast for Angel, it doesn't always happen, it is usually a ham or cheese sandwich. You know, the kind of sandwich when you just put a piece of cheese on a slice of bread and fold it up diagonally. Easy peasy lemon squeezy. Or, I simply wake her up earlier and bring her to school where breakfast is served at 8:30am. Or, which happens on most days, we wake up late, go out late and she ends up not having any breakfast. When I got to know about Bento Maker, I was inspired by the breakfast tools I saw and I knew it was time to finally put an end to my boring looking sandwiches. The great thing is that it actually doesn't have to take me very long to make these breakfast sets - all I needed was probably 10-15 minutes. And the result? I get a girl who wakes up, opens her eyes eagerly, and flashes me a big smile when she sees the breakfast lying in wait for her. Definitely worth it. Check out the products I've used for each of these cute-looking breakfasts. If I can do it, trust me, you can do it better. I put a piece of cheese between two slices of bread, placed the punch in place and pressed firmly. 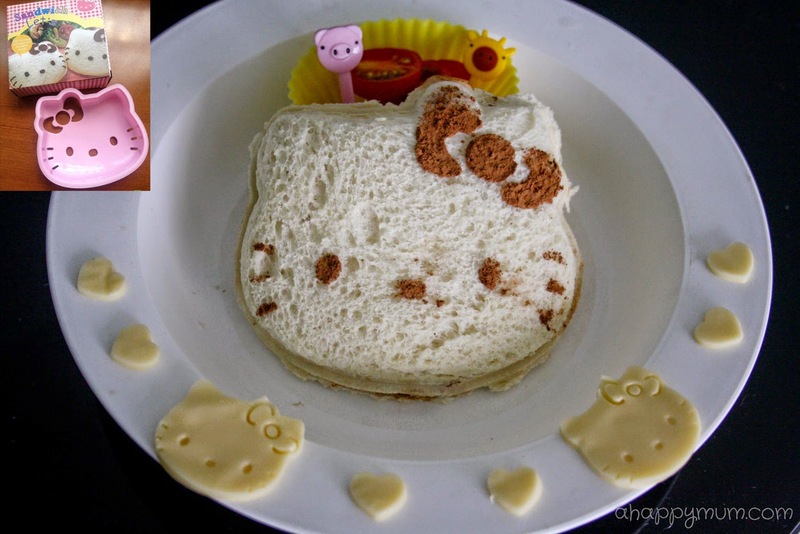 The Hello Kitty features were made by sprinkling cocoa powder. Tip: For all the bread punches, you can use a small scissors to trim away any excess along the border. When sprinkling the cocoa powder, make sure the bread is as close to the bread punch as possible. 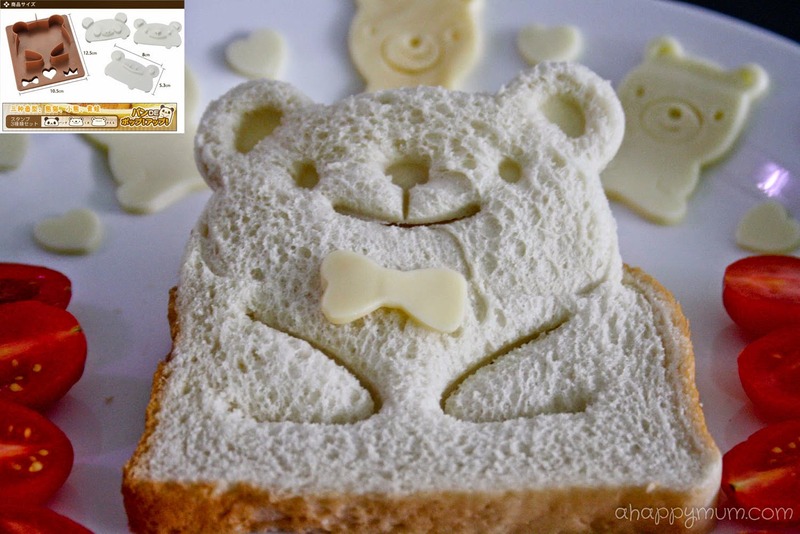 This is a 3-in-1 set where you get to make your bread into cute animal shapes and pop up! This should only be done on one layer of bread (top layer if it is a sandwich) and when it is cut, push the two sides of the bread into the middle to act as a support for the pop up. Tip: Use the stencils provided and add a ribbon, crown or bow to spice things up! 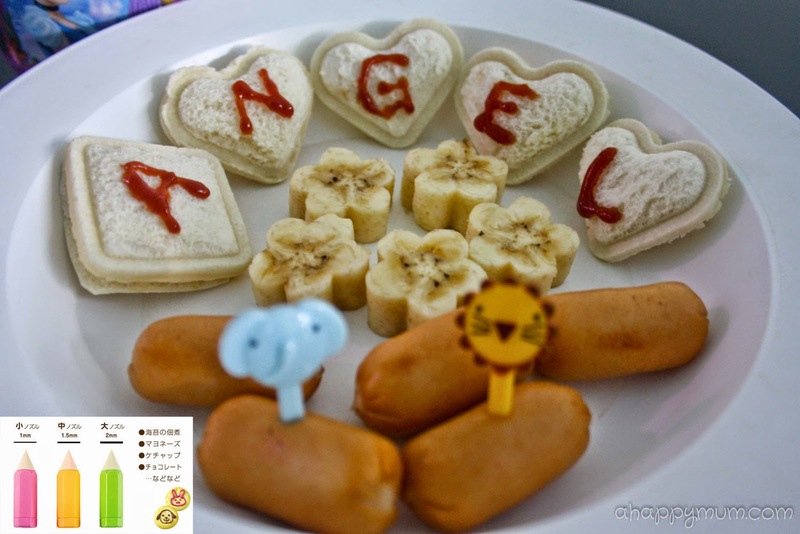 For kids, most often than not, food is made more appetising when it comes in small portions. 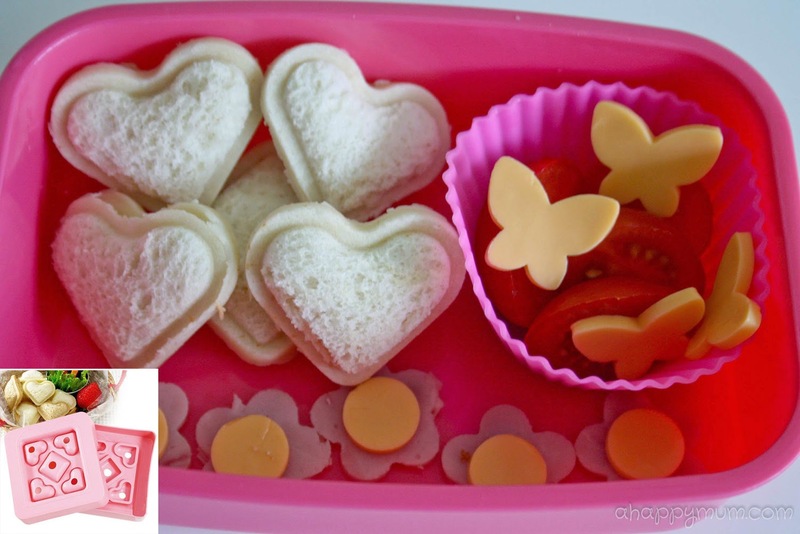 I love how this mini hearts bread punch is easy to use and speaks of love! Tip: Do not put a thick filling for this. I tried putting ham between two slices of bread and it was difficult to punch, so it would be best to stick to cheese or jam. You might also need to cut and trim the sides to make them neater. This is one of my favourites and of course, Angel simply loves rabbits too and I was amazed that she could finish the whole piece! Tip: Instead of cocoa powder, use Nutella and a chopsticks to create the facial features for the bunny and up the cute factor. Although the packaging shows that these are used to wrap around rice, I decided they could be part of breakfast. I removed the crust from a slice of bread, cut it into half, spread Nutella and rolled it up. Then using the stencils, I cut out the animal shapes from cheese and wrapped them around the bread. Tip: Give the animals some blush using chopsticks and tomato ketchup. Ever imagined that you could write on food? I didn't think of that and I must say it is brilliant. Thanks to the decorative pen set that comes with three different sized tips, I can now personalise the food with my girl's name or draw some hearts. Tip: Use a semi-liquid that is not too viscous and can flow easily out of the tip, for instance ketchup. 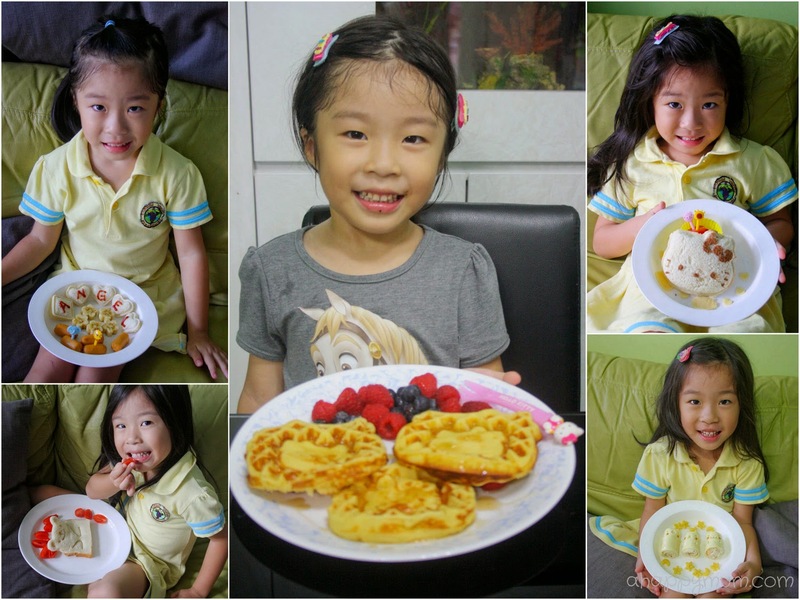 It has been longgg since I last made any waffles for the kids and this cute waffle maker just inspired me to do it again. I tried out this classic waffles recipe and it was easy to make - all I did was dump the ingredients into my Philips Jamie Oliver Food Processor and voila, the waffles even turned out to be crispy. 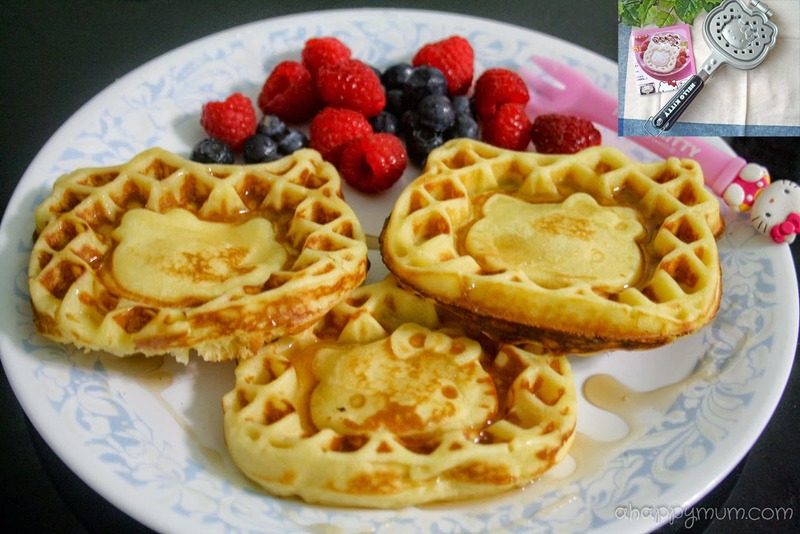 To learn how to use the waffle maker, watch this video. Tip: Remember to brush enough oil on both sides of the pan, if not you will end up with a sticky mess. Overall, I am really happy with how these bento tools have helped me to make breakfast more fun and enticing for my kids. I also wish to highlight that even though some of the products did not arrive in brand new packaging, they came promptly and in good condition. Considering how many of them are sold at below the market price, I think it is definitely worthwhile to have some of these handy and easy to use tools in the house. A happy day starts off with a good and healthy breakfast. Don't you agree? Since we are in the June holidays, why not consider making creative, fun and unique breakfasts with your kids and turn eating into a bonding affair? 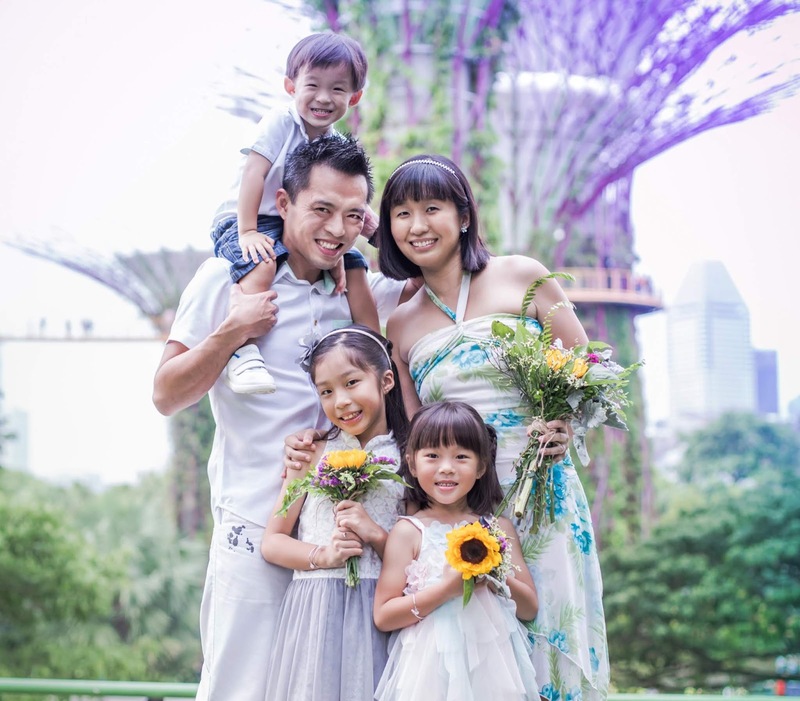 Bento Maker was started by Tricia, a mum to a 6-year-old who is extremely picky about her food. 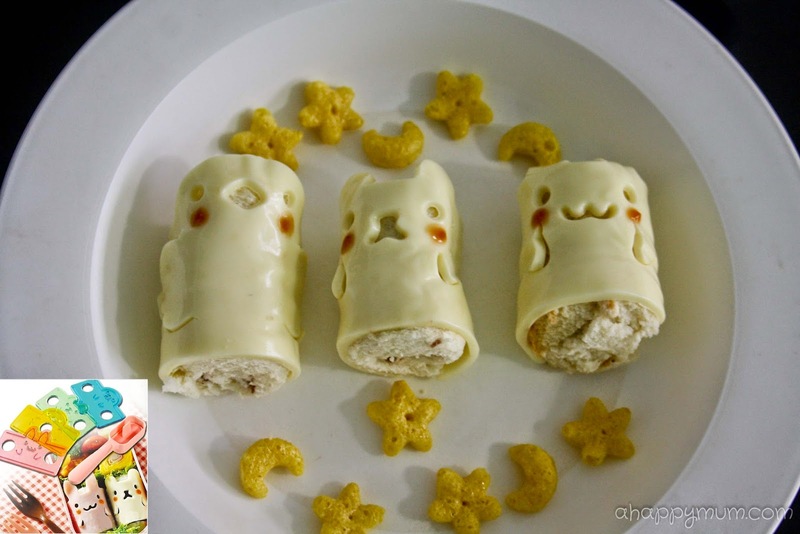 Having seen how her daughter gets fascinated by cute animal shaped tools and eats willingly without putting up a fight, she now runs Bento Maker as a hobby in the hope of encouraging families to bond over creating and decorating their own meals. Good news! 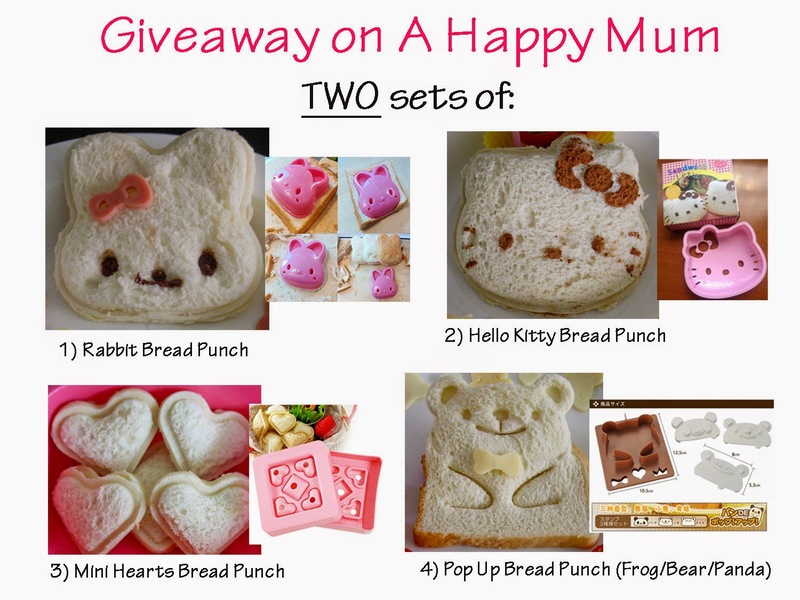 A Happy Mum is now giving away TWO sets of the above bread punches to two lucky readers residing in Singapore. To participate, leave a comment in this blog post with your name and email address, indicate in the Rafflecopter widget that you have commented and follow the rest of the steps if you wish to increase your chances of winning. Best of luck! Disclosure: I received the above listed items for review purposes from Bento Maker. 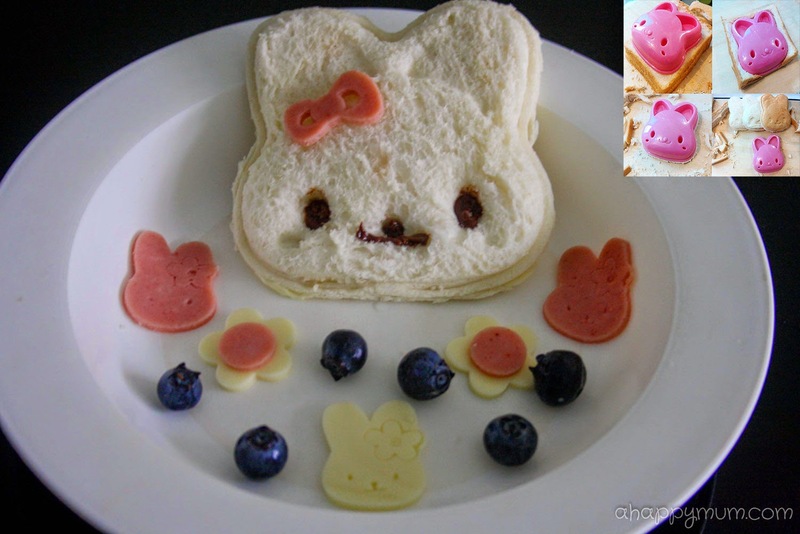 All other bento tools used in the pictures, including the Hello Kitty, bunny and bear moulds, animal picks and shape cutters are my own, same goes for all opinions and text. Wah this is such a great giveaway! I've been struggling to get Noah to eat more, and maybe, if he sees such cute faces on his bread, he might be motivated to eat more. My son loves rabbit cos he is born in the year of rabbit. Liked and share on facebook also. How super duper cute! I cannot stress on how tired I am of making peanut butter toasts! The girls are fine with eating it every day but I'm so tired of seeing it!!! I'm sure these fun shapes would make their eyes light up like Angel's! Or maybe we could even do this for an afternoon treat. Of course I've liked your FB page!!! It's me! Adora from gingerbreadmum! Wah can't wait to try all these!! Looking forward to doing this for my girl when she's older for she's still a baby now. Been wanting to make such cute sandwiches for my kiddos. Yours looks so cute! I only have very simple shape cutter. Lovely bread punch! Thanks for hosting this giveaway! Just the right tools for my boy!! Being wanting to know how you do these. Joining this giveaway. Hopefully can help me win a set to prepare 爱心早餐 for the kiddos :) Thanks for hosting! Wah!!! My two little girls sure love it !! Lovely! Thanks for hosting the giveaway! This is the answer to the problem that has been plaguing me for a long time! My kids don't eat or finish a slice of plain bread! Lovely sets! Thanks for the giveaway! Hello Kitty is my girl favourite. Hope i can win it! would love to get the bear/frog punch! Too cute to resist! Having loads of problems getting my gal to have her breakfast. I am sure this set will help! This is so fun! I saw the breakfasts you made and I was thinking how nice to be your children! I'm not a mom, but I take care of my cousins and wow they would LOVE these! I can never resist bento tools, and these are so cute! Thanks for the giveaway Summer! Such cute bento tools to spice up breakfast making and eating! The bread punch looks so cute. I hope to win it as I cant cook at all. With this, I am able to make a sandwich that my daughter will like. Life is full of surprises. As a kid, I had big dreams of becoming an entrepreneur or a CEO. 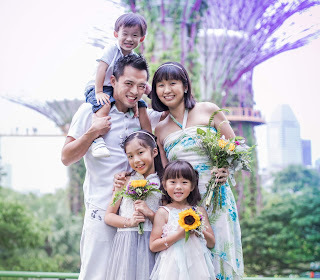 By a twist of fate, I ditched the allures of the corporate world, travelled half the globe and stepped into the gratifying journey of motherhood. It was then I realised that this was my destiny all along. With every breath, I am living my dream. Hi, my name is Summer. I am a mum of three and this is my journey. Copyrights © 2009-2017. All Rights Reserved. and are not to be duplicated or reproduced in any form without my written consent.